When The Mister and I were first married, funds were T-I-G-H-T! Ideas were available in your head, magazines, books, and/or friends. Creativity had to prevail. We did easy holiday décor like paper stockings (made with leftover red flyers), popcorn garland, pine cones, paper snowflakes, etc. Thinking outside the traditional store décor, we have been able to create a homey Christmas…… Not “What’s upppppp?? ?” homey but cuddle up with a blanket homey. Our budget has loosened a tad since then, but we still have to watch our expenses, AND we just don’t want to store a ton of STUFF. Anyone else? Sometimes Christmas décor is right under your nose. We had a plain Ikea picture frame. Ours was natural wood, but we believe Ikea now sells this one in black. Normally, it held family pictures, but for Christmas it got a makeover. This project is so easy, especially because you don’t have to paint. You can change out any frames you have around the house with holiday pictures just by adding professional photographed magazine pictures. No matter what your budget, time, and/or space restraints, you can have a festive home. Branches, pine cones, logs, plants, etc. Look to use something in a new way, ribbons, baskets, and more. We used a sheet here. You already have holiday décor like your gift wrap. You can use your gift wrap grouped together in a basket. Holiday cards clipped to a shutter. 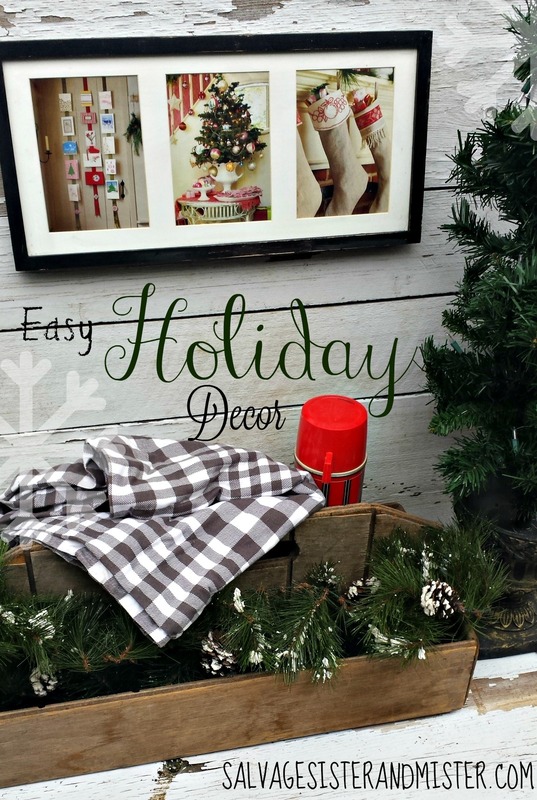 We have some additional ideas on easy holiday décor HERE. It doesn’t take a lot of time, money, or resources to add a few holiday touches to your home. And just think, small changes can make a big difference. We would love to connect with you on our site, Salvage Sister & Mister. Right now we have a wonderful free Christmas Printable, when you sign up for our weekly newsletter. Frame that printable and you have another holiday décor item. They have this Easy Holiday Stove Potpourri recipe to make your house smell fabulous! And this Cranberry Relish definitely needs to be on the menu for the holidays! And they have great tips and Creating a New Christmas Tree Every Year With What you already have! Lowes Holiday Makeover — Reveal in Macon, Georgia! Link Party Palooza — and TEKNIQ Camera Bag Giveaway!